VANCOUVER -- Listening to the postgame comments following Game 1 of the Western Conference Quarterfinals between Vancouver and St. Louis, it's tough to decipher which team came out on top. The Canucks and Blues were equally disappointed with their efforts to open the series. Vancouver coach Alain Vigneault said he was "confused" by his team's play in certain situations, while St. Louis bench boss Andy Murray said the Blues are "capable of playing a lot better." For as bad as each side apparently played, Vancouver and St. Louis both had their moments in a special teams bonanza that featured 13 minor penalties, which the Canucks won 2-1. It's back to the drawing board Thursday as both teams will hit the ice to work out the kinks in preparation for Game 2 of the series, set for Friday night at GM Place (10 p.m. ET, VERSUS, CBC, RDS). Vancouver will practice at 11 a.m. (PST) before the Blues hit the ice at 1 p.m. (PST), although St. Louis is expected to pack up and bus to the University of British Columbia to skate at Thunderbird Arena for the second time in three days. The Canucks may not get an up-close-and-personal look at what the Blues are tweaking, but you can bet a significant chunk of practice will be devoted to working on the team's power play. Although St. Louis moved the puck well and got a few good looks at the net, the Blues were 1-for-7 on the man advantage in Game 1 and a success rate of less than 15 percent simply isn't going to get it done. "They played solid, especially in the third period, they didn't give us very much, so we've just got to work on getting on the forecheck and breaking out a little more on the power play," said Brad Boyes, the only Blue to beat Roberto Luongo thus far. Despite the loss and the special-teams struggles, the Blues remain confident with the way they ended the regular season, and it's easy to see why. St. Louis hasn't lost back-to-back games in regulation since dropping a pair to the Edmonton Oilers and Calgary mid-January – that's a string of 41 straight contests, including Game 1 versus the Canucks. "We've rebounded well, but this is the playoffs and we've got to make sure we keep the intensity up, they're going to come hard again in their building," Boyes said. "We've got to play a little better in their end, play a little better system wise, and use that little of experience we had down the stretch to help us out." If Vancouver hopes to take a 2-0 series lead, the Canucks would also be smart to work on their power play as it was dynamite at getting pucks to the net early in Game 1 before trailing off late. 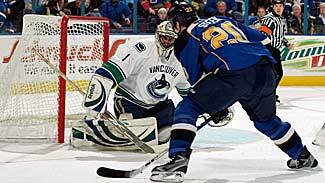 The Canucks had a golden opportunity to put this game out of reach on the power play with less than minutes left in the third period, but they had trouble getting set up in the Blues zone. Aside from that, the Canucks are simply looking to generate more offense five-on-five to ensure that their next win is by a bigger margin.